One if the bicolour salvias, Salvia sinaloensis ‘Aztec Blue’ has some of the best blue flowers of any of the genus. Truly one of the more ornamental varieties Salvia sinaloensis is a species from Mexico and it will spread slowly by underground runners. Best described as a true ‘Gentian Blue’ this is a summer flowering variety and is reasonably low growing. The flowers, that wonderful deep blue that is magical in the garden, small white markings on each petal add a contrast. This is a small clump forming variety that is an excellent addition to the front of the garden border. Also wonderful in a pot or container. A sunny position, a humus rich soil which is well drained is about all Salvia sinaloensis ‘Aztec Blue’ requires. Dig over the soil well before planting, add some compost if needed and you are ready to plant. Water in well with a liquid seaweed fertiliser and mulch around the plant to maintain a cool moist root run. Height – Will reach around 40 – 50 cm in height, usually on the lower side. Spread – Will spread to around 30cm. Flower colour – Gentian Blue with white markings. Frost tolerant – Moderate to light frosts only. 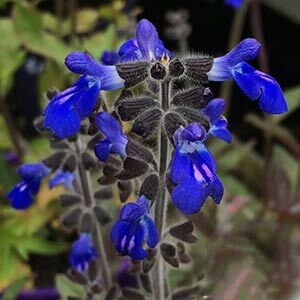 Salvia sinaloensis ‘Aztec Blue’ is available for sale from the following nurseries.